These photos claim to show a first-gen Zune running a firmware 2.14 that can purchase and download tracks over Wi-Fi with Microsoft points. They come from the same friendly Zune source that sent us the first photos of Zune 2.0 that some readers thought were Photoshopped. 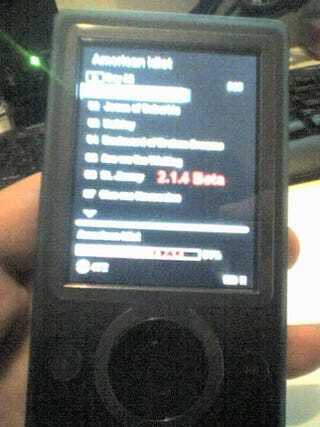 I can't tell if this is merely a first-gen Zune showing just an image of a firmware/download screen, or the true thing. What do you think? Rumor: First Zune 2.0 Photo? The same email the photos came in says that the Flash and Zune 2 will be announced within the month. The only lead I have to kinda confirm this is a report sent to me of a conversation between an unnamed high ranking Microsoft employee to our other source a month ago, with the quote, "if you like Zune, you'll love us on June 1st". But click on for another photo, and part of the email exchange I had revealing the June 1 date. But remember, this is all rumor. Add that to the private preview of the Zune Flash and 2.0 that went on this week, as reported by friends at iLounge, and you can tell that people are hungry for some revision. Can anyone who went to Monday's event at least tell us if the Zune's hardware is even going to look anything like the Zune 1? This ain't no gigabeat, remember? Good lord, I hope they lose the fake scrollwheel and replace it with a proper crosspad. Source the NES ones, you'll get fans that way.